Anyone who knows me is aware of my love of purple, so it should come as no surprise that when I saw bright purple mini-eggplants at the farmers market, I had to buy a couple. Unfortunately, I didn’t have a plan for what I would actually do with them, so a week or so went by before I got around to finding a recipe to use them in. Luckily the eggplants were still usable, and I found a very yummy-sounding recipe in Emeril Lagasse’s “Farm to Fork” for Eggplant Relish Crostini. I had some miscellaneous pasta leftover, so decided to use this relish type thing as a topping/sauce for pasta instead of on bread. There are lots of rumors about eggplant being hard to get right as it can remain bitter when cooked, but this was pretty simple, and absolutely delicious. The eggplant shrinks down a lot, so it doesn’t make a huge amount, and next time I will definitely make more and buy some bread to make the crostini. I used sundried tomatoes instead of roasted red peppers because I had those in my fridge, but the tomato flavor really came through and were one of the highlights of the dish, so I would use them again instead of red peppers. This does have a quite long list of ingredients, but most of the ingredients are fridge/pantry staples anyway, so this could be an easy weeknight dinner or a great party appetizer served on toasted bread. Heat 2 tablespoons olive oil in a large frying pan or skillet over medium-high heat. Add half of the cubed eggplant and sprinkle with 1/2 teaspoon of salt. Cook, stirring often, until eggplant is tender and caramelized, about 8-10 minutes. Remove to a bowl and repeat with the remaining eggplant. Set eggplant aside until cooled to room temperature. Add all of the remaining ingredients to the cooled eggplant (except feta and bread, if using), and stir gently to combine. Taste and adjust seasoning if needed. Set relish aside for at least 30 minutes to allow flavors to mingle. To serve, toss with pasta and top with crumbled feta, or serve on toasted rounds of bread drizzled with olive oil and topped with feta. As the season of endless barbecues approaches, it is always good to have a couple of stand by dishes that are easy to make and easily transportable. I like bringing side salads that are more substantial than simply lettuce and dressing, such as potato salad or this pepper/cucumber/tomato salad. I love this twist on a classic Greek salad, which only requires chopping up a few ingredients and throwing them in a bowl. It is especially good for bringing places because the lack of lettuce and marinade-type dressing means it doesn’t get soggy, and actually gets even more delicious in the fridge overnight as the flavors all meld together. The dressing is a very fresh red wine vinegar version, made even better by first using it to pickle the onions, which really takes out the bite of raw onion that not everyone is a fan of. My only regret in making this twice in the past month for various barbecues is that it gets eaten up so quickly that I wish I had saved some in the fridge just for myself. Mix together the red wine vinegar, water, salt, and sugar in a smallish bowl until the salt and sugar have dissolved. Add the diced onion and set aside for a few minutes. Core and seed the bell peppers, cut them into 1/2 inch pieces, and place in a large salad bowl. Chop the cucumber and feta into similar sized pieces and put them into the bowl as well. Drain the onions from the vinegar mixture, but reserve the vinegar for the dressing. Add the onions to the salad bowl, along with about 1/4 cup of the vinegar mixture. Drizzle with olive oil and season with salt and pepper. 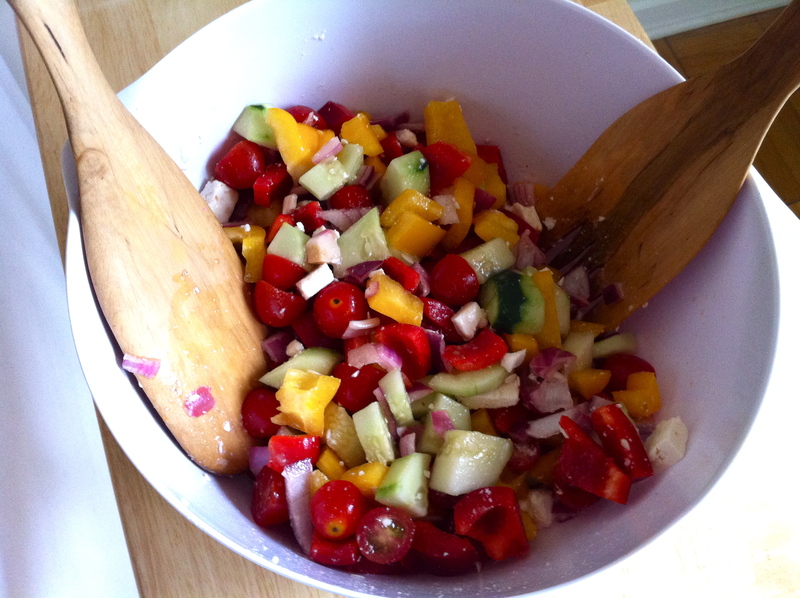 Toss everything together and adjust the dressing to taste- I usually use most of the vinegar mixture in the end. Serve immediately or let rest in the fridge for a few hours or overnight. Does this look like Mickey Mouse to anyone else? I am a big fan of cheap dinners that use mainly ingredients I already have in my cupboard, and this is one of my favorite go-to weeknight dinners for when I want something more exciting than pasta or a baked potato. 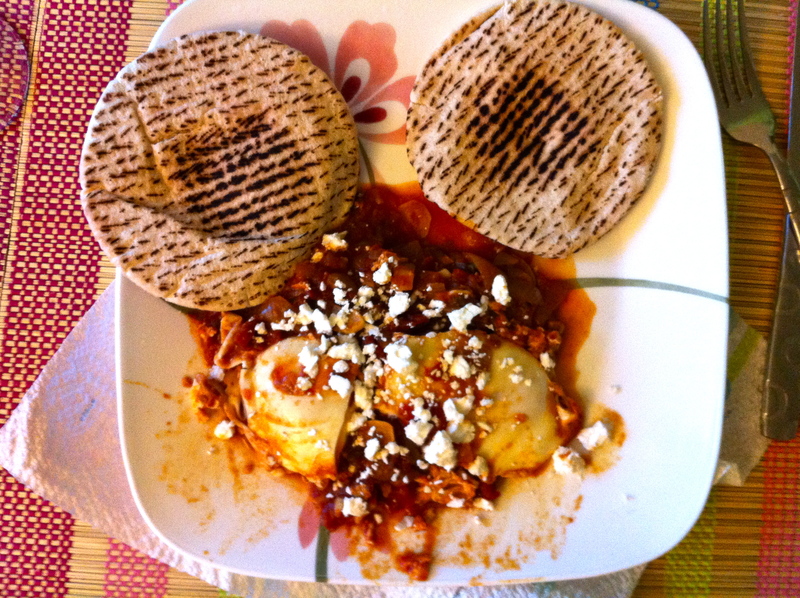 It is an Israeli dish of a spicy tomato sauce with poached eggs and feta cheese, and is seriously delicious. I suppose the addition of eggs make this a brunch-appropriate meal, but I will eat eggs any time of the day, and have always made this for dinner. It really only takes about 15 minutes to throw together and another 20 or so to cook, so is easy enough to make whenever you want. I usually make a big batch, and eat it a couple nights a week, heating up the sauce and adding more eggs as needed. 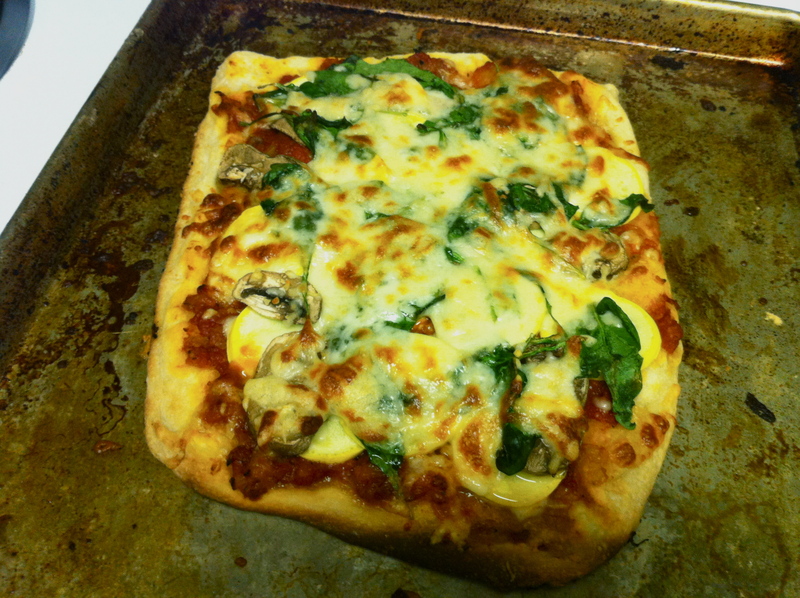 You can also use any leftover sauce with pasta, cous cous, or as a pizza sauce if you don’t want the eggs every time. The spice level can also be adjusted to your tastes- I usually err on the side of caution and only add 2 jalapenos, but if you’re making a big batch I would recommend adding one more, as the peppers really lose their spice once chopped up and cooked. Heat oil in a large saucepan over medium-high heat, then add chilies and onions and sautee until soft and golden brown, about 6 minutes. Add garlic, cumin and paprika, and cook, stirring frequently, until garlic is soft, another 2 minutes. Put tomatoes and their liquid in a large bowl and crush with your hands (this is a seriously good stress reliever). 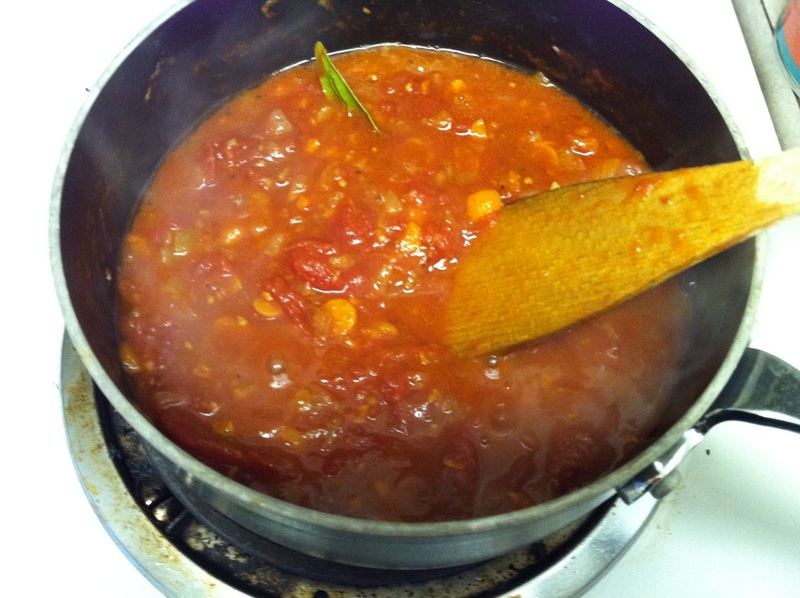 Add the crushed tomatoes and liquid to the saucepan, along with 1/2 cup water, and simmer about 15 minutes, stirring occasionally, until the sauce has thickened slightly. Season with salt, then crack eggs over the sauce. 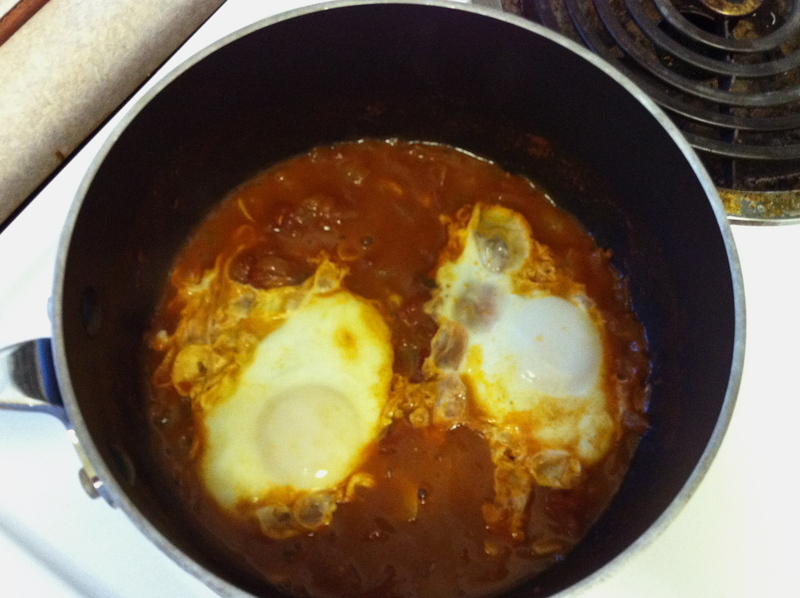 Cover saucepan and cook until the whites are set and yolk still runny, about 5 minutes. 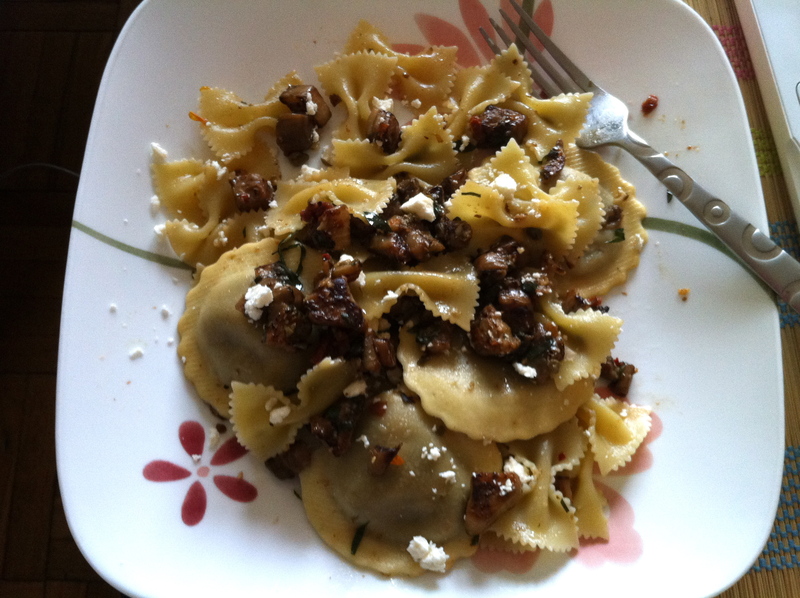 Spoon out eggs and tomato sauce onto plates, and sprinkle the feta and parsley over each plate. Serve with pitas for dipping, or alternatively cous cous on the side.